Other Products: Card Stock (White, Dark Pink, Peach, Green, Blue and Orange), Versafine inks (Vintage Sepia, Toffee, Deep Lagoon, Majestic Blue, Onyx Black and Olympia Green), Distressed Inks (Walnut Stain, Gathered Twigs, Bundled Sage, Tattered Rose, Wilted Violet and Dandelion), Dove Blending Pen, Quickie Glue Pen, Bronze Micro Beads, 3D Foam Dots, Versamark, Brilliance Inks (Pearlescent Sky Blue Pearlescent Rust and Pearlescent Thyme), Memento Dye Ink Pads (Pear Tart, London Fog and Grey Flannel), Archival Ink Pad Watering Can, Clear Embossing Powder, Crystal Clear Glitter, Rose Gold Embossing Powder, Spellbinders dies (Floral Tags, Devine Floral, Resplendent Rectangles, Labels Forty-Seven, Long Classic Rectangles Large, Curved Squares, Fancy Diamonds, Decorative Fancy Diamond, Astoria Labels and Astoria Decorative Element), Super Fine White Embossing Powder, Fern Green Embossing Powder, Silver Micro Glitter, Purple Micro Glitter, Martha Stewart Ink Pad - Sterling, Vintage Blue Embossing Powder, Tattered Rose Embossing Powder and die cutting machine. 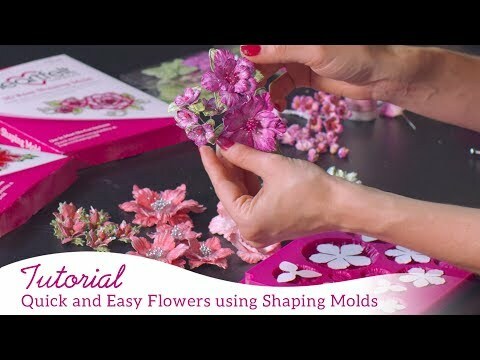 To see how to shape the flowering dogwood, watch the video at https://youtu.be/gI8RqHAt3vE. Instructions: To view some of the photos of the inside pages, see here. Visit my blog to see more photos. For the front cover, start by covering the front, back and binding with dark pink card stock cut 1/4" smaller for dimension and then cover with a second layer also cut 1/4" smaller using the Sugar Hollow Paper Collection. The sentiment was stamped on white card stock using Olympia Green ink and heat embossed with Clear embossing powder then die cut with the Cut Mat Create 2B Die and layered with another die cut out of dark pink card stock die cut with the Cut Mat Create 2A Die. Before attaching the sentiment, layer on 2 die cuts using green card stock and the Decorative Medallion Die. The classic petunias were stamped on white card stock using VersaMark and heat embossed with super fine white embossing powder before die cutting with the matching dies. They were distressed with a combination of pearlescent coral and pearlescent crimson inks and then shaped with the flower shaping tool and finished off with a stamen from the rock candy stamens-small collection. All the leaves were stamped on white card stock with watering can and die cut with the matching dies before distressing with pearlescent thyme ink. For the inside of the front cover, start by adding a layer of paper from the Sugar Hollow Paper Collection cut 1/4" smaller and fasten to the cover. Next, using the 6.25" x 4" insert, position it at the bottom of the page, also covering it with paper from the Sugar Hollow Paper Collection and finishing with a die cut from the Sweetheart Borders Die. The sentiment was stamped on white card stock with VersaMark and heat embossed with Rose Gold embossing powder before die cutting with the Devine Floral die. For the journaling pages I used a combination of pages from the Words to Live By Journal Pages and Heartfelt Inspiration Journal Pages. Page 2 was taken from the Words to Live By Journal Pages and for a little more dimension I added classic petunia flowers. The classic petunias were stamped on white card stock using VersaMark and heat embossed with super fine white embossing powder before die cutting with the matching dies. They were distressed with pearlescent thyme ink before shaping with the flower shaping tool and finishing off with a stamen from the rock candy stamens-small collection. 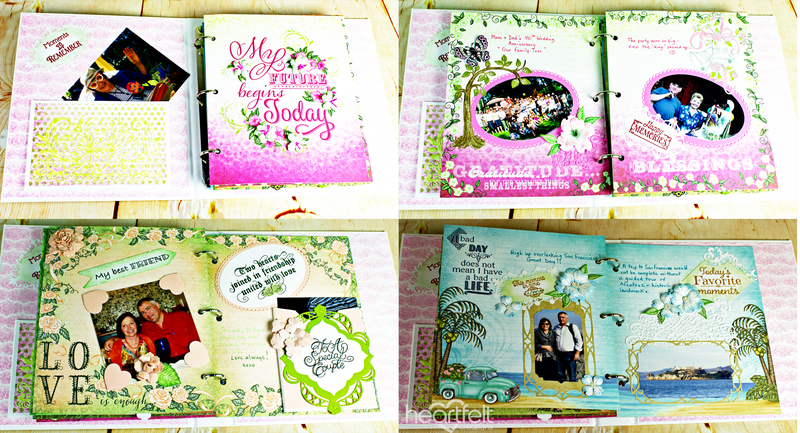 The photos on pages 3 and 4 were die cut with the Eyelet Oval & Basics Large Die. Page 3 was accented with the tree from the Sugar Hollow Hangout Cling Stamp Set, stamped on White card stock with rich cocoa ink and die cut with the matching die before coloring with a combination of walnut stain and bamboo leaves inks. 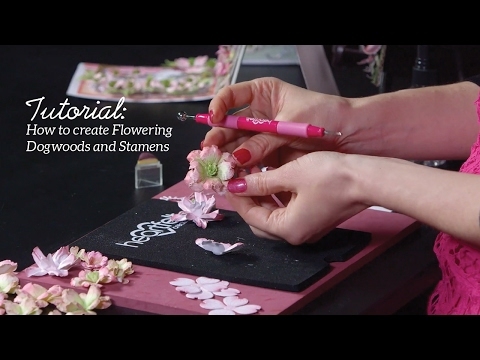 The flowering dogwood flowers were stamped on white card stock using VersaMark and heat embossed with super fine white embossing powder before die cutting with the matching dies and shaped with the flower shaping tools. The leaves were stamped on white card stock using VersaMark and heat embossed with fern green embossing powder before die cutting with the matching die. The butterfly was stamped on white card stock using Tuxedo Black and colored with a combination of pearlescent coral, pearlescent orchid and pear tart inks. The bell on page 4 was stamped on white card stock using watering can ink and die cut with the matching die before coloring with a dove blender pen and a combination of bamboo leaves and pearlescent coral inks. To finish off the bell use a quickie glue pen and silver micro glitter for a little sparkle. Finally the sentiment was stamped on white card stock using versamark and heat embossed with rose gold embossing powder and die cut with the floral tags die. The photos and on pages 5 and 6 were cut with the cut mat and create dies. On page 5 the bear playing the guitar was taken from the Beary Fun Retreat Paper Collection and popped up with 3d foam dots. The sentiment was stamped on white card stock using vintage sepia and die cut with the cut mat and create dies. The sunflower was stamped on white card stock using rich cocoa and die cut with the matching die before distressing with dandelion ink and accenting the center with bronze micro beads. On page 6 the sentiment was stamped on white card stock using majestic blue ink and die cut with the cut mat and create die. The sunflower was stamped on white card stock using rich cocoa and die cut with the matching die before distressing with dandelion ink and accenting the center with bronze micro beads. The small critters were stamped on white card stock using vintage sepia and die cut with the matching dies before coloring with the dove blender pen and a combination of gathered twigs and walnut stain inks. The small flower cluster was stamped on white card stock using watering can ink and die cut with the matching die before coloring with the dove blender pen and wilted violet ink and finally dusted with purple micro glitter. On Page 7 the photo was die cut using the eyelet hearts die. The sunflowers was stamped on white card stock using vintage sepia and die cut with the matching die before distressing with pearlescent rust and sunflower inks. 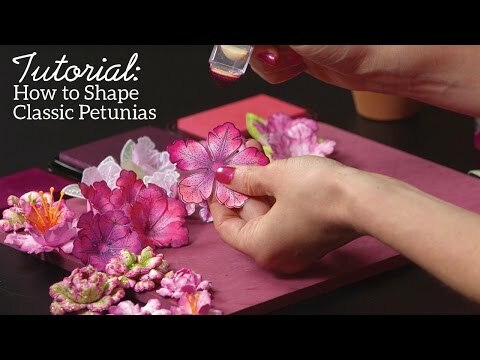 After shaping with the flower shaping tools the centers were accented with bronze micro beads. The butterfly was stamped on white card stock with tuxedo black and die cut with the matching die before coloring with a dove blender pen and a combination of pearlescent rust, blue and green inks. The sentiment was stamped on white card stock using deep lagoon ink and die cut with untamed tags before distressing with pearlescent rust ink. On page 8 the photo was die cut with the resplendent rectangles die. The tropical florals were stamped on white card stock using majestic blue and die cut with the matching die before shaping with the flower shaping tool and coloring with a dove blender pen and a combination of pearlescent coral and pearlescent thyme inks. The tropical foliage was stamped on white card stock using watering can and die cut with the matching die before distressing with pearlescent thyme. The flowering dogwood was stamped on white card stock with VersaMark and heat embossed with super fine white embossing powder and die cut with the matching die. After shaping with the flower shaping tool the flowers were distressed with pearlescent rust ink. The butterflies was stamped on white card stock using tuxedo black and die cut with the matching die before coloring with a dove blender pen and a combination of pearlescent rust, blue and yellow inks. Finally the sentiment was stamped on white card stock using deep lagoon ink and die cut with labels forty-seven before distressing with pearlescent rust. On page 9 the photos were die cut with the cut mat and create dies. The leaf flourish was stamped on white card stock using Olympia green and die cut with the matching die before distressing with pearlescent thyme ink. The sentiment was stamped on white card stock using onyx black and die cut with the long classic rectangles large die. On page 10 the photo was die cut with the cut mat and create die. The portal image was stamped on white card stock using London fog and die cut with the matching die before distressing with grey flannel ink. The sentiment was stamped on white card stock with onyx black and die cut with the curved squares die. The small fish was stamped on white card stock using London fog and die cut with the matching die before coloring with a combination of pearlescent coral, summer sky, yellow and thyme inks. The classic rose was stamped on white card stock using sterling ink and die cut with the matching die before shaping with the flower shaping tool and accenting with prills. 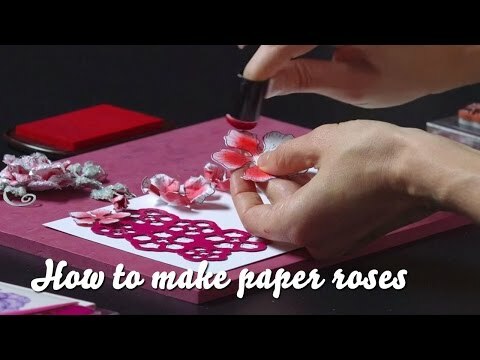 The classic roses on page 11 and 12 were stamped on white card stock using VersaMark and heat embossed with tattered rose embossing powder before die cutting with the matching die. After distressing with tattered rose ink they were shaped with the flower shaping tool. The sentiment on page 11 was stamped on white card stock with Olympia green and fussy cut before dusting lightly with crystal clear glitter. The sentiments on page 12 were both stamped on white card stock with olympia green and die cut with either the fancy diamond die or the eyelet oval & basics small die. The photos on page 13 and 14 were die cut with astoria labels and the dogwood flowers were stamped on white card stock using VersaMark and heat embossed with vintage blue embossing powder and die cut with the matching die. After shaping with the flower shaping tool they were lightly distressed with sky blue ink and accented in the center with prills. The sentiments were both stamped on white card stock using toffee ink and die cut with either the floral tags die or the untamed tags die and distressed with bundled sage ink.